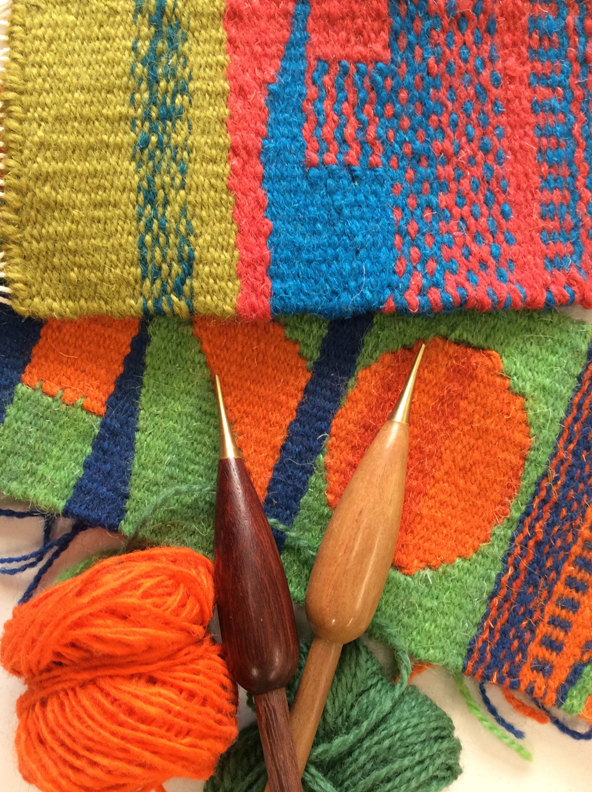 This weekend workshop will introduce you to the basic skills involved in creating a woven tapestry, from warping up a simple frame loom to exploring flat woven techniques creating shapes, lines and colour blending. You will be working with a range of traditional materials of a cotton warp and wool weft. When you are comfortable working with these materials you can go on to explore the variety of surface qualities that can be achieved by using a wider range of materials such as cotton, linen, sisal and paper. The course is designed for beginners – weavers with little or no experience but is also suitable for students developing and building on existing skills. The workshop is structured to provide individual tuition in small groups of 4-6 students. Fiona Hutchison graduated from the tapestry department, Edinburgh College of Art in 1985. She exhibits regularly in the UK, Europe and internationally. As well as teaching many independent workshops and mentoring emerging artists she also teaches tapestry weaving and stitched textiles for department of Life Long Learning at Edinburgh University. Workshops run from 10am – 4pm. Selection of materials will be provided. Book 2 more workshops/or early booking in full – 10% discount.